At the weekend I sowed some chilli seeds, following on from the minor success of last year, having managed to grow a handful of Jalepenos, Hungarian Hot Wax’s and Red Cherries, all of which produced a useful and tasty crop of fruit. …30 seconds of searching and they were located! 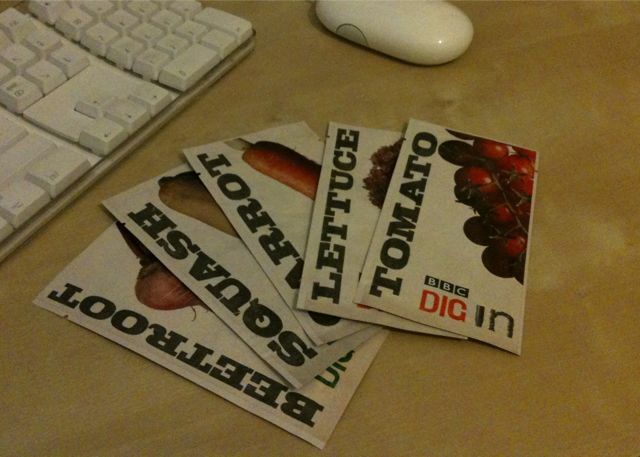 The Beeb has very kindly supplied me with tomato (sweet and delicious), beetroot (tasty both raw and roasted), butternut squash (great roasted, baked or mashed), carrot (sweet and crunchy) and lettuce (an irresistible Italian frilly with red-tinged leaves). I’m especially looking forward to growing the tomatoes – maybe a tasty salsa with the de Cayenne chillis is in order!